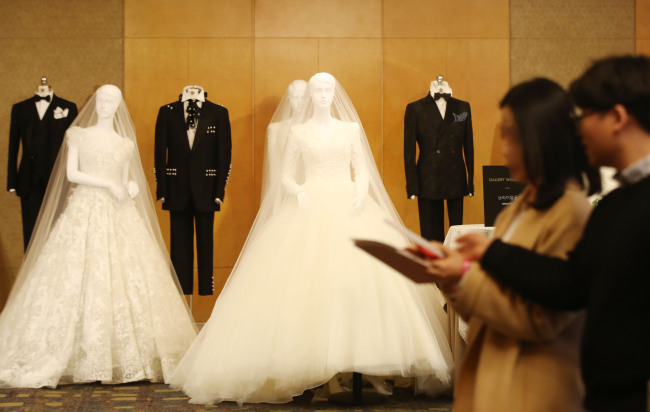 The number of South Koreans getting married fell to the lowest level in more than 40 years in 2018, government data showed Wednesday, as young people delay marriage amid a prolonged economic slowdown. The number of couples tying the knot came to 257,622 in 2018, compared with 264,455 in 2017, according to Statistics Korea. The figure is the lowest since 1972, when the number of couples who got married came to 244,780. Some young people are delaying marriage or giving up on marriage altogether, and having babies as they struggle with future uncertainties. The data showed that the average age of South Korean men getting married reached a record high of 33.1 years in 2018, compared with 32.9 years in 2017. It also showed that the average marrying age of first-time brides stood at 30.4 years in 2018, up from 30.2 years in 2017. The statistics office said the number of South Koreans marrying a foreign spouse came to 22,698 in 2018, up 8.9 percent from a year earlier. Among them, Vietnamese brides accounted for the lion's share at 38.2 percent, followed by Chinese at 22.1 percent and Thai at 9.4 percent. In comparison, Chinese men accounted for 24.4 percent of foreign males who got married with South Korean women, followed by Americans at 23.6 percent and Vietnamese at 9.6 percent.